Europe’s Vega rocket has been given the green light for a nighttime liftoff from French Guiana at 1:42 UTC on Wednesday with the Mohammed VI-A satellite for the Kingdom of Morocco. Built by European aerospace companies Airbus and Thales Alenia, the satellite is flying a semi-secret mission to double as a civilian asset for environmental monitoring and mapping and as a military imaging craft to collect data for border and coastal security in the North African nation. 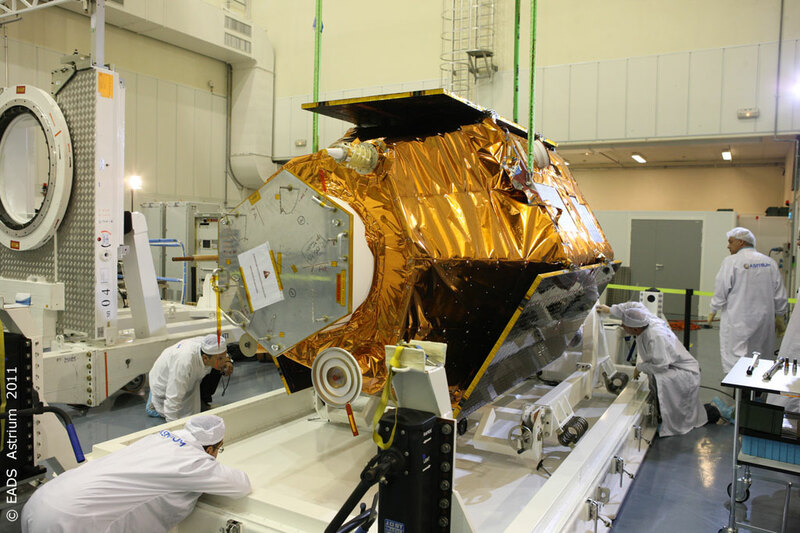 The Moroccan government contracted Airbus Defence and Space and Thales Alenia Space in late 2013 for a pair of high-resolution imaging satellites based on the Pleiades high-resolution imaging spacecraft launched for operation by the French Space Agency in 2011 and 2012. Due to their role in national security, the two missions were treated with some secrecy – showing up under the code names MN35-A and MN35-13 in Airbus documentation before the Mohammed VI designation was revealed only a few weeks before launch. 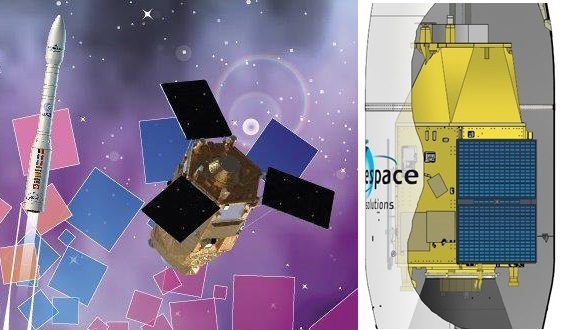 No photos of the satellites have been published with the exception of illustrative depictions in the official launch poster for the mission, but it is understood that both MN35 satellites use the same architecture of Pleiades and the upcoming Falcon Eye satellites, also built under a similar collaboration between Airbus and Thales for the United Arab Emirates, targeting launch atop Vega rockets in 2018/19. The 1,110-Kilogram Mohammed VI-A satellite is based on the Airbus AstroSat-1000 platform, a highly agile design relying on Control Moment Gyros for rapid slew capability that allows the satellite to image a multitude of ground targets in a single observation pass. The craft’s instrument, provided by Thales Alenia as an upgraded version of the Pleiades imager, uses a 65-centimeter telescope and advanced line detector arrays to capture black-and-white imagery at a ground resolution better than 70 centimeters and color / near-infrared imagery at a resolution better than three meters. According to official information, the two Mohammed VI satellites will be used for mapping and land surveying, regional development, agricultural monitoring, disaster prevention and monitoring, environmental and desertification monitoring as well as border and coastal surveillance. The launch contracts for the two Mohammed VI satellites were only awarded to Arianespace early this year and the Mohammed VI-A satellite takes advantage of a launch slot opening on relatively short notice after ESA’s ADM-Aeolus experimental wind-profiling satellite suffered a lengthy launch delay into mid-2018. 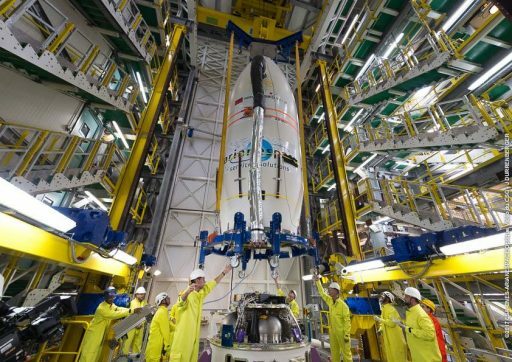 With the VV11 launch slot opening up, advantage was taken to accelerate the launch of Mohammed VI-A as the satellite had already finished construction and environmental testing. Without much fanfare, the satellite arrived at the launch site on September 22 to enter final processing including fit checks with its launch adapter and loading Hydrazine maneuvering propellant into the satellite. The four-stage Vega rocket finished stacking in October and the satellite had taken its place atop the vehicle by November 3 for final checkouts leading into a Launch Readiness Review conducted on Monday to provide final clearance for liftoff Tuesday night. 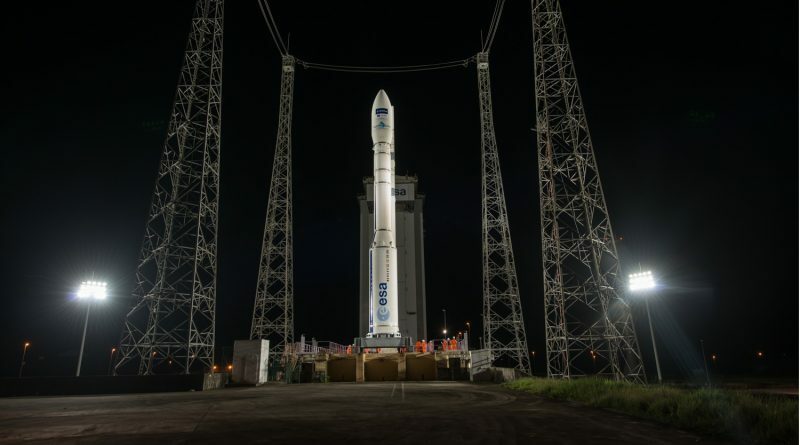 Tuesday night’s launch is the eleventh flight of the light-left member in the Arianespace launch vehicle family, the third and last planned Vega mission in 2017 and the tenth Arianespace-operated launch this year. With an all-solid rocket and an upper stage carrying storable propellants, Vega will not require any dynamic operations such as propellant loading during its countdown. Countdown operations pick up at T-9 hours and 10 minutes and are largely focused on checks of the rocket’s Multi-Function Unit that is in charge of controlling all aspects of the mission. Both payloads will be on internal power when Vega’s automatic countdown sequence kicks off at T-4 minutes to put the rocket through final reconfigurations for liftoff, targeted for precisely 1:42:31 UTC. 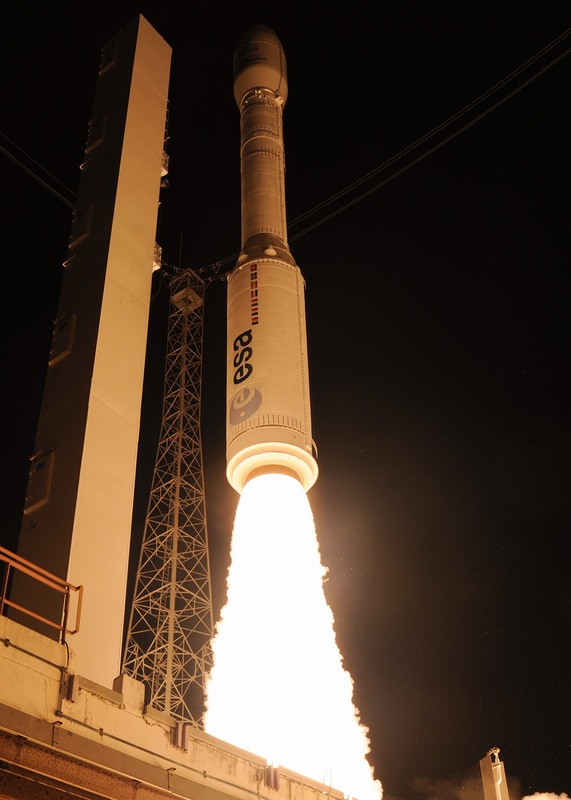 Upon Ignition of its P80 first stage, Vega will literally jump off the ground – generating a total thrust of 280,000 Kilogram-force to lift the 137-metric-ton vehicle. 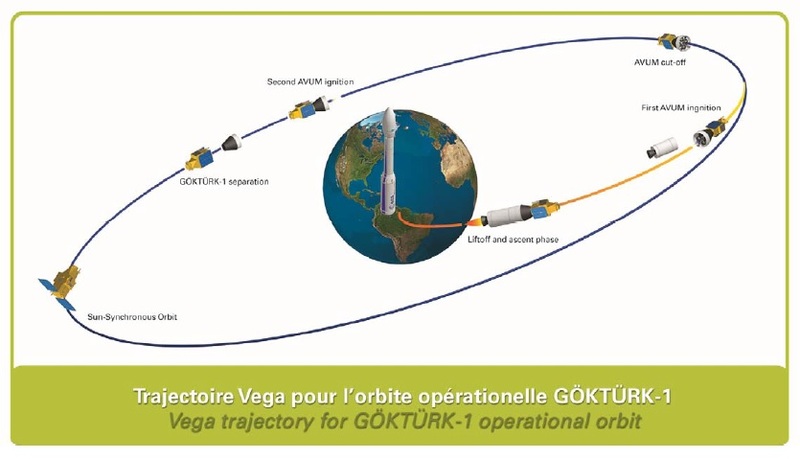 Seconds after lifting off, Vega will pitch over to begin flying to the north, aiming for a Sun Synchronous Insertion though the exact target orbit parameters have not been released for this semi-secret mission. The 11.2-meter long first stage will burn over 88 metric tons of solid propellant in just 117 seconds, accelerating the rocket to a speed of around 1.7 Kilometers per second. Burnout on the first stage is sensed by the declining chamber pressure, triggering the pyrotechnic stage separation sequence at T+1:57 to set up for the ignition of the second stage, designated Zefiro-23. Separation of the 8.4-meter second stage is expected after Vega climbed to an altitude of around 150 Kilometers and a speed exceeding 3.5 Kilometers per second. Ignition of the Zefiro-9 stage comes 12 seconds after Z23 separation at T+3:52. Although it is the smallest of the three stages, Z9 has the longest burn time – firing for 120 seconds at an average thrust of 23 metric-ton force. The protective payload fairing will split open and separate five seconds into the burn of the third stage when Vega will be well outside the dense atmosphere where aerodynamic forces can no longer harm the vehicle. Zefiro 9 accelerates the vehicle nearly to orbital velocity, aiming for separation from the AVUM, the Attitude and Vernier Upper Module, six minutes and 34 seconds into the flight. AVUM will be tasked with a fairly straightforward two burn mission typical for SSO injections with the first burn to lift the stack into an elliptical Parking Orbit peaking at the desired orbital altitude for half an orbit of coasting ahead of a circularization maneuver. Ignition of the AVUM Main Engine Assembly, built around a Ukrainian RD-869 engine, is planned eight minutes and three seconds into the flight on a burn of seven minutes and 45 seconds to reach orbit. 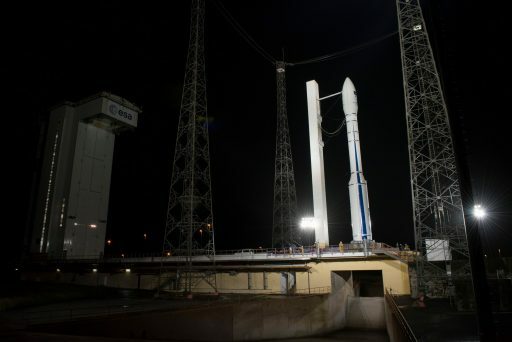 The 250-Kilogram-force main engine will re-light 52 minutes and 6 seconds into the flight on a shorter burn of one minute and 51 seconds to circularize the orbit and set the stage for the spring-loaded separation of the Mohammed VI-A satellite at T+55 minutes and 33 seconds. At this point, the primary mission will be completed and Airbus tasked with initial acquisition and commissioning of the satellite ahead of several weeks of checkouts and fine-tuning of the optical payload before the spacecraft will be turned over to its operator. AVUM will be set for another 78-second burn one hour and 47 minutes into the flight to remove itself from orbit to close out Wednesday’s mission.